Previously the president has given updates concerning the debt ceiling negotiations during the day, for the president to reserve a 9pm time slot for this announcement would leave one to believe this is a somewhat major announcement. At this point we have 2 paths to select from…. Harry Reid has presented a proposal of $2.7 Billion dollars in cuts that do not include any increase in revenue. Important to remember that Speaker Boehner and the GOP have said all along that raising the debt ceiling will have to include cuts equaling or greater than the amount being requested to raise the debt ceiling about $2 Trillion dollars. 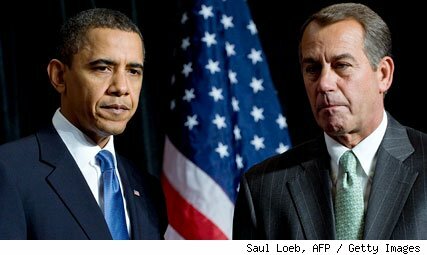 Speaker Boehner and the GOP is looking for a short-term deal where the debt ceiling will be raised to get thru this year and then another debt ceiling vote will take place in 2012. President Obama has been adamant that he is looking for a long-term solution (similar to Harry Reid’s plan); the president is looking to provide stability so to give confidence that this debate will not happen again. The hope is this will return the focus back to job creation and keeping the economy moving in a positive direction. At this point it looks like the Democrats will be unable to broker any deal containing revenue generation; this is a disappointment But the GOP may have shot themselves in the foot. In the ‘Grand Bargain’ deal Obama offered a tax hike that was less than if he simply let the Bush Tax Cuts expire at the end of 2012. If the GOP continue to refuse to accept revenue generation in this debt ceiling deal, Obama will go hard on letting the Bush Tax Cuts expire and Republicans will basically be responsible for large tax hike they could have avoided. All in all it will be interesting to hear what the president will be announcing at 9pm; some how we have to get pass this debt ceiling issue before default 8/2/2011. Hopefully we can avoid serious damage being done to credit rating as a nation; any downgrade of the United States credit rating will have an effect on ALL of us!! !